With opening kickoff still a few days away it’s still the season for predictions. While everyone is making their “expert” predictions, and picks, I make making my BOLD predictions for the upcoming season. 1. Jake Rudock starts every game and leads the Big Ten in passer efficiency, while throwing a career high in touchdowns and less than three interceptions. This is the one prediction that could come back to bite me the most. The depth chart the Michigan released earlier this evening stated Rudock OR Shane Morris as the starter. I believe that Rudock will start week one, and on top of that he is going to start every single game this season, and do so with much success. Rudock is already a very efficient quarterback, and in Harbaughs system he will shine, he is just like Alex Smith was in San Francisco under Harbaugh. Nothing flashy or dazzling, but he is a game manager and very safe quarterback. 2. Drake Johnson will return week two and carry the load for Wolverine running backs rushing for 1,076 yards and 7 scores. When healthy, Drake Johnson is the best running back on this roster. Yes, I said it. Johnson came on late in the season last year before suffering an ACL injury against Ohio State. However, when Johnson was healthy, he was an absolute weapon. While the Wolverines happen to have a bit of a logjam at running back with Johnson, Ty Isaac, Derrick Green, and De’Veon Smith, one player needs to lead the way for the group. That player will be Drake Johnson when he returns. 3. Derrick Green will also rush for over 1,000 yards on the season, pairing with Johnson to become the only 1,000 yard rushing duo in NCAA Division 1 this season. That logjam I was just talking about? It’s a good thing. While Smith is atop the depth chart as of now, Green may get the bulk of carries and yards against Utah. It may be a time share of the two Wolverines with the most experience the remainder of the season once Johnson returns from injury. If I have to put a number on it, I say Green goes for 1,032 yards, and five scores. Pair that with the production of the offensive line under Drevno, and you’re looking at old school Michigan football again. 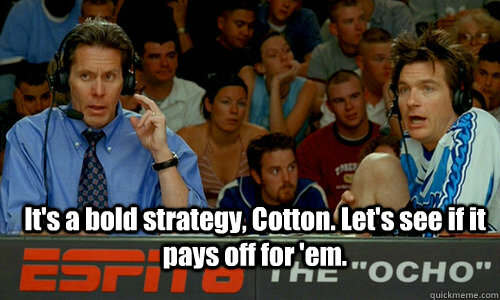 Pound the football until your opponent is tired, and Jake Rudock tosses a sweet touchdown off a play action fake. 4. Jabrill Peppers is a Heisman Finalist due to his superior return skills, NCAA leader in INT’S, and 685 receiving yards, and 5 touchdowns. I am going to go along and say that Jabrill will take three of those interceptions back for touchdowns, and also lead the NCAA in kick and punt return touchdowns as well. The kid is an absolute monster, and he is going to wow the entire nation on live TV Thursday night. Just watch, he will channel his inner Woodson, and have a complete season. 5. The Wolverines pull of a win against either Ohio State or Michigan State. On paper these are two nearly impossible games for the Wolverines. But lucky for Michigan games are not played on paper. While it would be wise to choose Michigan beating Michigan State, rather than Ohio State due to the fact that they might not have a weakness…. I feel the opposite. Again, on paper, the Spartans are an easier opponent than Ohio State, but the past few years have shown us that doesn’t really matter. 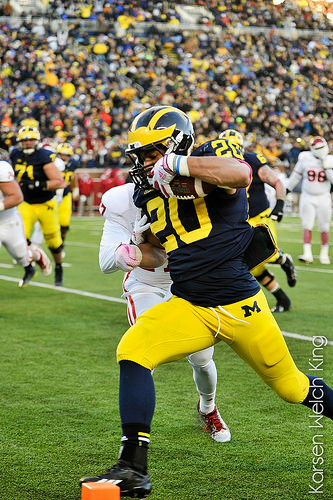 Michigan has been able to hang with the Buckeyes with talented players and mediocre coaching. So what happens when you take the same talented team and add elite coaching? WINS. Lee Corse was right, Harbaugh will be Urban Meyers biggest nightmare… And right now, Urban is very very scared of Harbaugh. One last piece of business to take care of. Not a bold prediction, but a bit of a fun game. Harbaugh will most likely wear a headset while on the sideline for the Wolverines, unless he trolls the entire fan base and goes without one (which is doubtful). So to have some fun, I am going to set an over/under on how many times Jim Harbaugh throws his headset in a fit of rage. I ask the Maize and Blue Nation family to join in, give me your Harbaugh rage prediction, and help me this season keep track of how many times the headset gets tossed. Use the hashtag, #Harbaughragetracker to join me in keeping track. 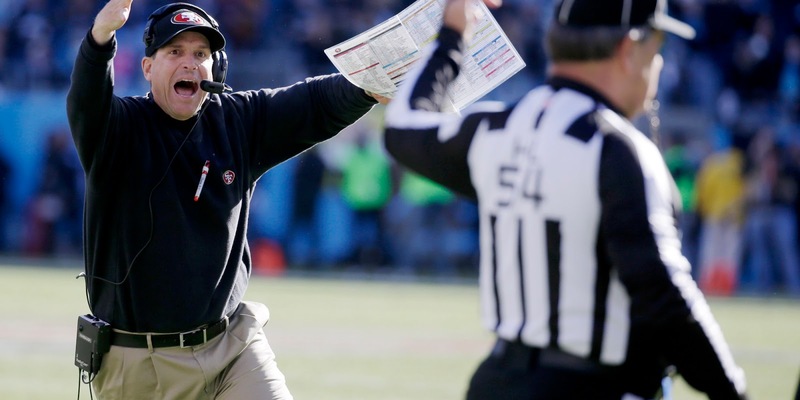 Even when Harbaugh is just going crazy on the sideline, use the hashtag.